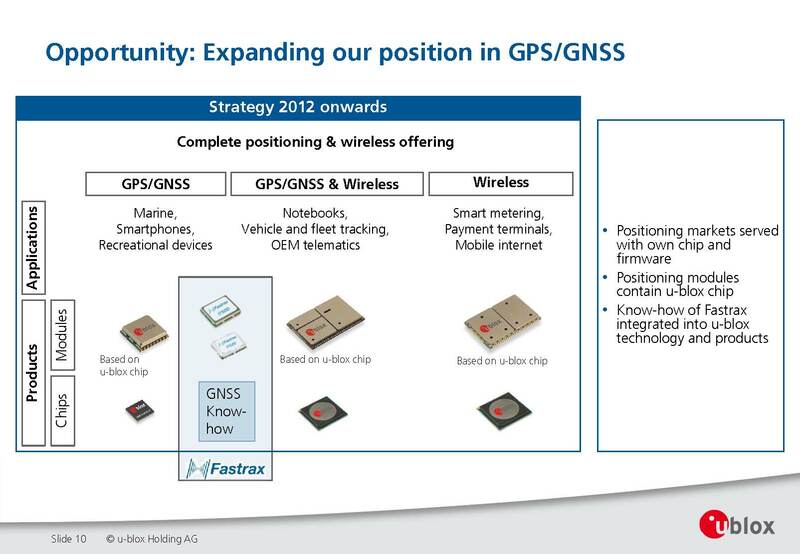 A u-blox presentation on the acquisition highlighted Fastrax’s strengths as including GNSS correlator and algorithm know-how, module-making and manufacturing capability, and sales channels via distributors. u-blox says it will integrate Fastrax products into the company’s product development road map, incorporating u-blox chips into the modules offered to Fastrax customers, including a version of Fastrax’s low-power IT530 receiver module built around the u-blox 7 chip. The acquisition entails purchase of 100 percent of the shares of Fastrax Oy at a price of €13 million. Certain payout rules apply to Fastrax management members. The transaction closed on Monday (October 29, 2012). u-blox expects revenue of around CHF 2 million and an EBIT of CHF 100,000 for the remainder of 2012, and revenue of CHF 13 to 15 million with an accretive EBIT margin of 15-20 percent for 2013.